Examples of developmental abnormalities in Pleistocene people. Left to right: the Tianyuan 1, Sunghir 3 and Dolní V?stonice 15 abnormal femora, Center, top to bottom: the Palomas 23 mandibular “flange”, the Rochereil 3 cranial lacuna, the long Sunghir 1 clavicle, the Malarnaud 1 incisor agenesis. Right, top to bottom: the Shanidar 1 sacral hiatus, the Pataud 1 polygenesis, and the Dolní V?stonice 16 cleft palate. Credit: Erik Trinkaus. Erik Trinkaus, an anthropologist at Washington University, has found what he describes as “an abundance of developmental anomalies” in people that lived during the Pleistocene. In his paper published in Proceedings of the National Academy of Sciences, he describes his study of fossils recovered from several sites in the Middle East and Eurasia, and what he found. The Pleistocene is the period from approximately 2.6 million years ago to approximately 11,700 years ago—it spans the last Ice Age. Prior research has shown this was also the period during which anatomic modern humans developed and spread outside of Africa. In this new effort, Trinkaus suggests it was also a time during which humans experienced a wide variety of physical deformations. His study consisted of gathering data on 66 fossils recovered from various sites, most of which were from approximately 200,000 years ago. 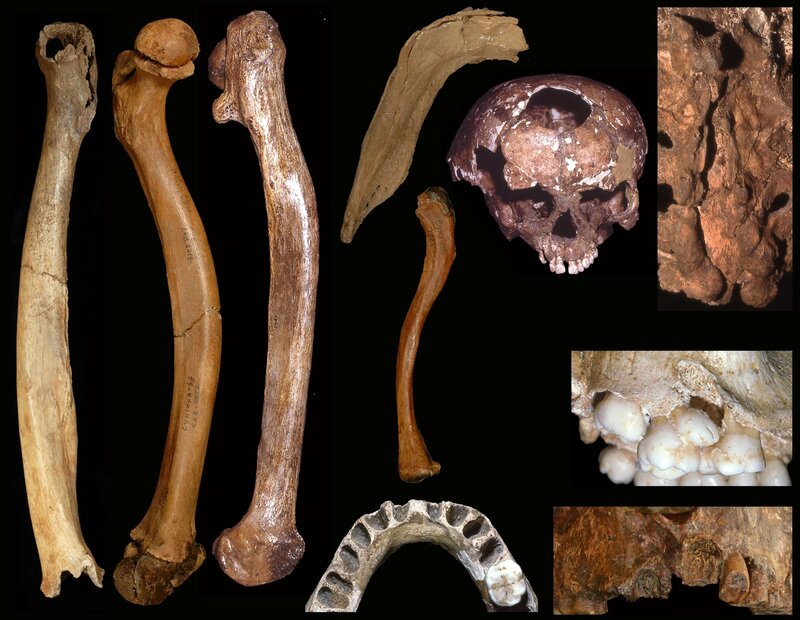 He notes that most of the remains were from young adults and represented several species of Homo. In looking at the physical structure of the fossils, he found an unusually high number of deformities such as bowed arms or leg bones, or misshapen skulls and jaws. Intrigued by the high numbers, he added them up and averaged them among the group under study and compared the results with modern human anomalies. Trinkaus found that among the fossil samples was evidence of 75 abnormalities. He also found that approximately two-thirds of those anomalies showed up in less than 1 percent of modern humans. He also found that the abnormalities came about due to a variety of ailments such as blood disorders or hydrocephaly—but a lot of them could not be traced to a cause. He suggests the number of abnormalities is extremely high for such a small group of fossils. Trinkaus suggests inbreeding is one of the more likely reasons for such a high number of abnormalities—hunter-gatherer groups of the time are believed to have been rather small, increasing the odds of inbreeding. He also suggests that it is possible that individuals with such abnormalities received special treatment during burial, which increased the odds of their remains surviving to the modern age for analysis.